292 What Did Radio Think of KISS_ We Dig In and Find Out! Episode 292, July 17, 2018. What does radio think of KISS? This week we are joined by radio industry veteran Michael Cross. For decades Michael has been a DJ as well as a Program Director... the person responsible for the sound of a station, responsible for what gets played. Michael is also a KISS fan, going back tot he early 70s. We talk with Michael about how KISS was seen by radio since the 80s. How well did the label do promoting the band. How did they stack up with all the other bands. If ... Más informaciones you have any interest in the behind the scenes of the music business, especially radio this week's episode is for you! 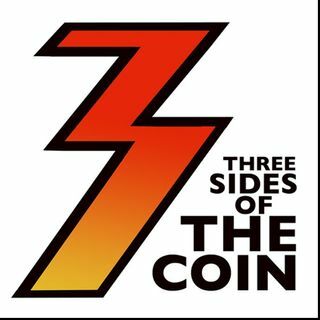 Since launching in 2013 Three Sides of the Coin has been viewed or listened to over 4,000,000 times. Three Sides of the Coin has been joined by special guests including former KISS lead guitarist Bruce Kulick, Eddie Trunk, WWE Superstar and lead singer of Fozzy Chris Jericho, Angel lead guitarist Punky Meadows, Five Finger Death Punch guitarist Jason Hook, Vinnie Vincent Invasion and Slaughter lead singer Mark Slaughter, Twisted Sister’s Dee Snider, comedian Craig Gass, KISS’ former business manager Chris Lendt, the Black Veil Brides' Andy Biersack, Frank Munoz associate producer for Ace Frehley's Anomaly album, award winning songwriter Adam Mitchell, Ed Kanon (Peter Criss' drum tech), Kevin Valentine (drummer on KISS' Psycho Circus album). Three Sides of the Coin was picked (October 2013) as a 'What's Hot' podcast by Apple's iTunes. In the early '90s, Michael Brandvold launched the fifth ever website on the Internet devoted to KISS, KISS Otaku. He built, launched and maintained Kissonline.com (KISS' official web presence). He now owns Michael Brandvold Marketing, providing marketing services and digital strategy to musicians. Tommy Sommers spent 15 years on the record show circuit collecting, trading and selling memorabilia / Kiss merchandise. He is now a successful residential Real Estate agent in the Minneapolis / St. Paul area. Tommy has also produced a KISS song For The Oddfathers and is the owner of Rock Steady Digital Photography. Mark Cicchini, is a world renown KISS collector. KISS have used parts of Mark’s vast KISS collection for audio, video & print materials including their book NOTHIN TO LOSE, CD re release of the LOVE GUN album & the VH1 Ultimate Album KISS ALIVE! special as well as many other KISS projects. His wife also makes a mean meatloaf!!! It's only our opinion... it's neither right nor wrong. Three Sides Of The Coin is unofficial & unsanctioned and has no affiliation with the band KISS. Great episode! Not Kiss related but did have a dj record and replay my comments. It was before Van Halen III was released and the dj has said EVH said he did a lot or writing and playing guitar while on the toilet. I had called in and just said ‘Does that mean the new record is gonna sound like crap?’ They recorded it, replayed it after a break and joked that they hoped it wouldn’t and there was no way VH would be bad and we all know how well VH III was received.